Nacogdoches, Texas’ oldest town, offers natural wonders and lessons from the past. Nacogdoches brags about its age — claiming the title of oldest town in Texas — and you can scarcely turn around here without bumping into a historical marker or old structure. But the landscape in and around the East Texas town — woods of towering pines, an arboretum, azalea gardens and a native plant center — ranks as equally worthy of boasting about. My oldest daughter, Holley, attends Stephen F. Austin State University. Her senior year, I decided that we should finally check out the sights of the town together. She had some favorites to share with me, and we discovered a few new ones as well. One of downtown’s tallest structures, the six-story Fredonia Hotel, opened in the 1950s, the first East Texas hotel with a swimming pool. It closed in 1985, but was renovated and reopened in 1989. After checking in, I took advantage of its convenient location and strolled a half-block to Church Street, one of many still paved with brick. I ogled a delectable bakery case behind the window at Shelley’s Bakery Cafe and peered in the window of Milford’s Barber Shop, where a row of patient men and squirming boys waited their turns. From Church, I turned onto Main Street, which is lined with art galleries, antique shops and boutiques. Brick buildings encircle the azalea- and rose-bedecked main square, which houses banks, the fire department, city hall, more antique stores and gift galleries and the visitor center. Here, I picked up a brochure for a historical downtown walking tour, which takes in a 750-year-old Caddo burial mound, a circa-1897 land office, the site of a Texas Revolution encampment and historical cemeteries and homes. Live dinner music was a hallmark of the Fredonia when it was brand-new, and the tradition continues today with live entertainment Thursday through Saturday. My daughter met me at the hotel in time to snag a table on the tree-shaded patio to enjoy The Mustn’ts, a local band including founder Jeromy Barber and Holley’s friend and fellow SFA student Vicki Tippit. “Most people describe our music as indie, quirky and harmony- and melody-driven,” Tippit says. Band members hail from all over the U.S. 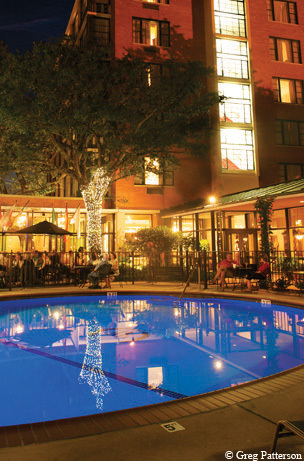 The hotel restaurant serves dinner on the patio, and we ordered crab cakes for an appetizer, followed by grilled salmon and tilapia Pontchartrain topped with spicy crawfish cream sauce, accompanied by a bottle of wine and the toe-tapping music. The adjacent hotel bar, Nine Flags, offers lighter menu options. Those extra three flags, by the way, result from the Gutierrez-Magee, Long and Fredonia rebellions, each an early attempt by locals to establish Texas independence from Mexico. Who knew Nac had such feisty residents? Saturday morning, Holley ran a 5K at the university, so I slept in, then met her for coffee and a tasty danish at her favorite coffee shop, Java Jack’s on North Street. Free Wi-Fi, good coffee and comfy chairs make this a popular hangout. We then explored the university’s Mast Arboretum, 10 acres along Lanana Creek covered with trees and plants — many of them labeled — paths, bridges and more benches than you can shake a stick at. The trees rise so high you have to tilt your head back to see the tops. Across the creek, trails crisscross the eight-acre Ruby M. Mize Azalea Garden, home to more than 7,000 hale and hearty azalea bushes of every imaginable color. Other treasures tucked into the arboretum include a honeybee hive, a gazebo and fountains. Access the arboretum from Wilson Drive or East College Street, with plenty of parking at either point, and the azalea garden from Raguet Street. Next stop, near the center of campus: the Stone Fort Museum, a 1936 re-creation of the home of Don Antonio Gil Y’Barbo, using original stones. Settlers in Nacogdoches were forced to move to San Antonio in 1772, when Spain deemed maintaining a mission here too costly. A Spanish trader, Y’Barbo led some of those intrepid settlers back in 1779, at which time Nacogdoches received designation as a pueblo, making it Texas’ first official town. 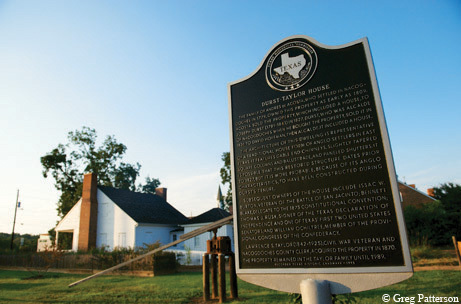 In addition to housing Y’Barbo’s family, at various times, this stone structure served as offices, a grocery store, saloon and even fortifications during the Battle of Nacogdoches — an early effort in the fight for Texas independence, when settlers drove out Mexican troops in 1832 — before being torn down in 1902. Fortunately, the stones were saved, and the campus landmark now serves as an interpretive center for area history prior to 1900, with emphasis on Spanish and Mexican periods. Legend has it that any student who enters the building won’t graduate, so I toured the museum alone. The dark stone walls and creaking wooden floors provide a perfect backdrop for the clothing, implements and other items from native Caddo and Tejas residents of the town, which sat at the important crossroads of El Camino Real and La Calle del Norte. We could also have toured the Sterne-Hoya House Museum, a circa-1830 frame residence still on its original site, and the Durst-Taylor Historic House and Gardens, the second-oldest dwelling in town and home to a number of influential historical figures. But the afternoon turned warm, perfect for an outing to Tonkawa Springs, a private camp about 20 minutes north of town anchored by a natural pool of clear, cool water over a soft, sandy bottom. We took a dip, lounged at a shady picnic table and contemplated returning there sometime for a camping trip. 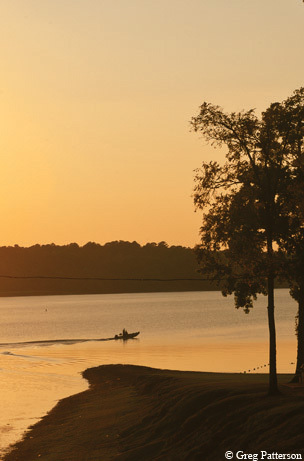 Other options for water recreation in the area include nearby Lake Nacogdoches and Ratcliff Lake. At the former’s Eastside Park, rows of pickups and boat trailers testified to the lake’s popularity with fishermen. Shaded picnic tables, trees full of noisy birds, a playground and a wide, grassy bank make it pleasant for families, too. The 45-acre body of water at Ratcliff Lake Recreation Area features fishing piers, a swimming beach, boat ramps, campgrounds and hiking trails. These include the 1.5-mile Tall Pines Trail and the 20-mile Four C National Recreation Trail, which traverses miles of scenic woods, most notably the Big Slough Wilderness Area. Multiple access points make it possible to enjoy a shorter route; at the end of the trip, I bagged roughly six miles. After having a fun and lively night downtown the previous evening, I booked a room for my second night in town at the aptly named Pine Creek Country Inn, not far from Lake Nacogdoches. A main lodge and cabins occupy sprawling, pine-covered hills bisected by a creek and dotted with ponds populated by croaking frogs. A swimming pool, horseshoes, badminton, games and fishing poles could easily fill an entire weekend. We enjoyed a delicious dinner at the inn (served Thursday through Saturday), followed by a relaxing evening. Sunday morning, I made coffee and wandered the grounds, listening to the birds. Bright cardinals zipped across the drive, and a woodpecker hammered on a utility pole. Weekend breakfast, served buffet-style, included biscuits, muffins, eggs, sausage, gravy, cereal and fruit. We then headed back to town and spent a pleasant hour or so wandering the university’s Pineywoods Native Plant Center, more than 40 acres with a large loop trail, roughly two miles long. Under a canopy of trees, the sun-dappled grounds included tangles of 6-foot-tall thistles, vines too large for my hand to grip and crazy-colored lichens. Resting on a bench overlooking the rushing creek, I heard an owl, cardinals and other birds, and saw the flash of a bright red tanager. At the front of the property, more than 100 native wildflowers grow in a demonstration garden dedicated by Lady Bird Johnson. Then we took in another dose of history at Millard’s Crossing Historic Village, a collection of historical structures moved from various sites in Nacogdoches County to a spacious property just outside Loop 224. Guided tours last about one and a half hours and take in seven of the buildings, which include a log cabin, parsonage, corn crib, country store and schoolhouse. Tours start whenever folks show up. You can join one in progress or drop $2 in the box, grab a walking tour map and wander on your own. We ended the day at Clear Springs Restaurant (a sprawling brick building next to the railroad tracks), which was once the first refrigerated warehouse west of the Mississippi. No surprise in this history-rich town, and not a bad setting for heaping plates of fish tacos and fried catfish. My stomach and camera memory card full, I reluctantly said goodbye to my daughter and Nacogdoches, at least until next time.